This article will explain how to generate barcodes based on a number from each record. A number field that you want to display as a barcode. A details page where you want to display the actual barcode. It is important to note that some older web browsers will not support this. IE9 and greater as well as modern versions Firefox, Safari, and Chrome (including mobile versions of Safari and Chrome) should be fine. This recipe will use add a new text formula field that will mirror the value from your existing number field. This new text formula field will be used to display a scannable barcode on a details page. Because we already have an Order Number field, we want to duplicate that value so we can see both the barcode and the Order Number. The easiest way to do that without maintaining two separate number fields is to use a text formula field that simply references your existing Order Number field. You can read more about adding text formula fields here. The font include is some simple CSS that you'll add right into the builder. In order for this to work in your app, you'll need to find your text formula field's ID number. Once you have your field ID, you can copy the code below and paste it into your own app's CSS tab, making sure you update the field ID values. Note that you can also add this to your own custom stylesheet if you're embedding the app into another website. Please note that this code example does use Azelia font. This format may not be readable by all scanners. You can use custom CSS in your app, to change the font for generating your UPC. Please check out this example in our developer documentation for more information: How to change a page’s font. Note: This CSS will cause the text formula field to show a barcode wherever it is displayed throughout the app. This is okay in this example because we have a separate Order Number field that we can use as well. If you need to limit it only to show the barcode on a specific page or view, you can add some additional classes or IDs to the CSS. 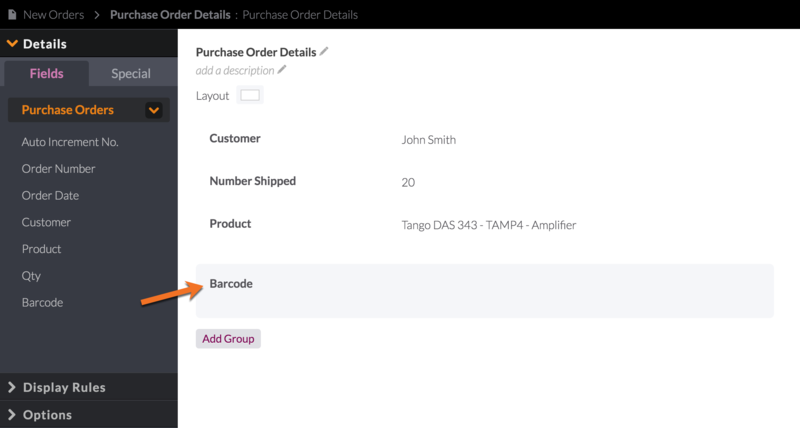 The last step is to add this new text formula field that represents our barcode, to the view where you want to display it. Then if you preview your app and look at this details page, you can see the barcode font is being used for that text formula field and instead of showing the actual number. If the scanned barcode isn't generating the value that you stored in it, please check to make that the scanner you are using can read code-39 barcodes specifically: http://www.azalea.com/code-39/.